The mission of the AFP Foundation for Philanthropy is to enhance philanthropy and volunteerism through programs of education, research and service that benefit those that lead, serve and support nonprofit institutions. The purpose of the Foundation is to generate the resources to fund AFP strategic initiatives that advance ethical and effective fundraising. Your donation will be used to further these efforts and includes support of the Chamberlain Scholarship which awards an international convention scholarship to an Orange County AFP member every year. Donations should be directed to AFP Foundation for Philanthropy, 4300 Wilson Boulevard #300, Arlington, VA 22203. Email the completed form to foundation@afpglobal.org; or fax it to 703-683-0735. Please contact us at 800-666-3863 with any questions. One of the best ways to connect with AFP is to join a committee. Our chapter committees are designed to serve you and advance the great programs and opportunities we have to offer. Contact a committee chair to learn more. The BE the CAUSE Campaign Committee is responsible for promoting and engaging members with AFP’s annual giving program, which empowers the organization to offer invaluable services and programs to AFP members and friends. The purpose of the Diversity Committee is to increase diverse membership within AFPOC with the goal of creating an atmosphere of diversity within philanthropy by increasing capacity of nonprofit organizations who serve underrepresented communities and diverse professionals who work for nonprofits in Orange County. We aim to accomplish this goal by providing opportunities to AFPOC members to learn about (1) diversity among the chapter's membership and (2) diversity and inclusion methods within the scope of philanthropy and fundraising. The Education Committee is responsible for planning and executing the monthly chapter Advancing Fund Development and Luncheon Presentation programs. Additionally the committee is responsible for the Giving USA program. 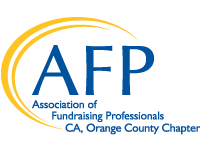 The Marketing Committee is responsible for engaging members and other audiences to build a community surrounding our programs, resources and events while advancing the brand of AFP Orange County. The Membership Committee is responsible for planning and executing a membership recruitment plan, coordinating membership mixers and events and hosting new member orientations. The Mentoring Committee is responsible for facilitating the mentoring program including recruiting mentors and mentees and planning the graduation program. The National Philanthropy Day Committee is responsible for planning and executing all aspects of the annual celebration of Orange County’s National Philanthropy Day. The Sponsorships Committee is responsible for cultivating, soliciting and stewarding individuals, businesses and nonprofits interested in supporting the ongoing work and strategic goals of the chapter. The Chamberlain Scholarship committee is responsible for disseminating the scholarship application forms and selecting on qualified applicant. The Webinars Committee is responsible for selecting the slate of programs for the year, schedule webinar facilitators and promote the program to increase attendance. The Youth in Philanthropy Committee is responsible for facilitating youth-drive philanthropy and increasing youth knowledge about the nonprofit sector.